Sen. Charles Grassley is demanding answers on the Trump dossier that sought to smear the President. A point that should be examined closely is brought up here… why did the FBI offer to pay Christopher Steele for investigating Trump? Grassley wants an answer from Comey over that issue and fast. He’s particularly interested in Deputy Director Andrew McCabe and his role in the Trump-Russia affair. Why is the FBI delving into partisan politics here? A few weeks before the FBI offered to pay Steele for the dossier, the Democrats also paid him. It looks like the FBI never followed through on payment to the spy, but they were all set to pay him. What is the story here? The FBI and the Democrats were actively investigating a political opponent. Unless there is something solid there to indicate it is a national security issue (and a serious one), that is extremely unethical and perhaps illegal. I would also like to know if there were communications on this matter between the Clinton camp and the FBI. It appears there were, which makes Comey and the FBI look complicit and very, very bad. 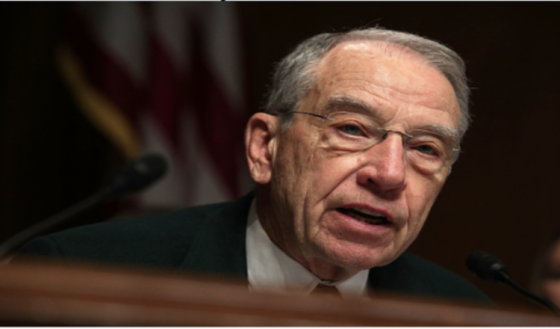 Sen. Charles Grassley, chairman of the Senate Judiciary Committee, has sent a letter to FBI Director James Comey demanding the story behind the FBI’s reported plan to pay the author of a lurid and unsubstantiated dossier on candidate Donald Trump. In particular, Grassley appears to be zeroing in on the FBI’s deputy director, Andrew McCabe, indicating Senate investigators want to learn more about McCabe’s role in a key aspect of the Trump-Russia affair. Grassley began his investigation after the Washington Post reported on February 28 that the FBI, “a few weeks before the election,” agreed to pay former British spy Christopher Steele to investigate Trump. Prior to that, supporters of the Hillary Clinton presidential campaign had paid Steele to gather intelligence on Clinton’s Republican rival. In the end, the FBI did not pay Steele, the Post reported, after the dossier “became the subject of news stories, congressional inquiries and presidential denials.” It is not clear whether Steele worked under agreement with the FBI for any period of time before the payment deal fell through. The fact that Obama would use law enforcement and intelligence agencies to further his political agenda does not surprise me in the least. But he should be held accountable for that. Hearings need to be convened over this surveillance of Trump and his associates. This is far more serious than Watergate ever was. Grassley is gunning for McCabe. He noted that McCabe is already under investigation by the FBI‘s inspector general for playing a top role in the Hillary Clinton email investigation even though McCabe’s wife accepted nearly $700,000 in political donations arranged by a close Clinton friend, Virginia Gov. Terry McAuliffe, for her run for state senate in Virginia. “While Mr. McCabe recused himself from public corruption cases in Virginia… he failed to recuse himself from the Clinton email investigation,” Grassley wrote, “despite the appearance of a conflict created by his wife’s campaign accepting $700,000 from a close Clinton associate during the investigation.” McAuliffe is dirty as hell and here we are with Comey and the FBI again. Is it a coincidence he let Clinton walk during all this? I highly doubt it. All of the involved parties should be investigated at the very least and go to prison if found guilty of breaking the law here. Once again the dominant media narrative has shifted overnight. Last week the media exploded with stories about Attorney General Jeff Sessions’ admitted contacts with the Russian ambassador to the U.S., the latest attempt to somehow derail and delegitimize the Donald Trump presidency. It is part of the narrative concocted by the Democrats and their allies in the media to claim that Trump won the election thanks in part to help from Russia. Collusion has been the word of choice, though no evidence has surfaced to support it. It turns out that the Obama administration, according to reports, did go to the FISA (Foreign Intelligence Surveillance Act) court to gain permission to spy, or electronically eavesdrop, or wiretap some members or elements of Trump’s campaign. They apparently were turned down back in June, and approved in October, after taking Trump’s name out of the request. The media called foul after Trump’s tweets, and the word of the day became “baseless,” as in baseless accusations by Trump. They said he had “no evidence” to support these very serious charges against his predecessor, Barack Obama. But the allegations of Russian influence were largely orchestrated by the Obama administration, and were ramped up when Trump defeated Hillary Clinton in November. That is when he decided to impose new sanctions and expel Russian diplomats, which never would have happened if Hillary had won. Now, using his group Organizing for Action (OFA), Obama intends to continue influencing the political scene with a shadow government apparatus. OFA has been coordinating with groups such as the Soros-linked Indivisible. “Obama is intimately involved in OFA operations and even tweets from the group’s account,” writes Paul Sperry for the New York Post. “Run by old Obama aides and campaign workers, federal tax records show ‘nonpartisan’ OFA marshals 32,525 volunteers nationwide.” It has also raised over $40 million, according to Sperry. In other words, President Obama wanted information potentially damaging to his successor kept at the forefront of the national discussion whenever possible. It could be even better for Obama if there were Congressional investigations; that might distract Trump from rolling back Obamacare or the unsigned Iran deal. The Times also reports that the administration “sent a cache of documents marked ‘secret’ to Senator Benjamin Cardin of Maryland days before the Jan. 20 inauguration.” These documents were shared with Congressional Republicans, as well. It should come as no surprise that the Obama administration would be aggressive, since the Obama administration waged a war on leakers, prosecuting more cases than all previous administrations combined, while harassing numerous media figures. But while Trump appears to have stumbled by not producing evidence to support his claim, in fact his move may result in changing the narrative once again. Now the investigation could include Obama’s and Hillary’s ties to the Russians. After all, the same Russian ambassador who met twice with then-Senator Sessions visited the Obama White House at least 22 times during Obama’s presidency, including four times in 2016. Were any of those meetings about presidential politics? Hillary’s ties to the Russians have been well documented, including the Uranium One deal and Skolkovo, the Silicon Valley of Russia that provided them with dual-use technology and handed millions of dollars to Hillary’s campaign manager, John Podesta. He might have added that you empower Russia’s ally Iran with more than $100 billion dollars, and a pathway to becoming a nation with nuclear weapons, to go along with its current status as the number one state sponsor of terrorism. We at Accuracy in Media find the allegations of Russian interference in the election to be flimsy at best. 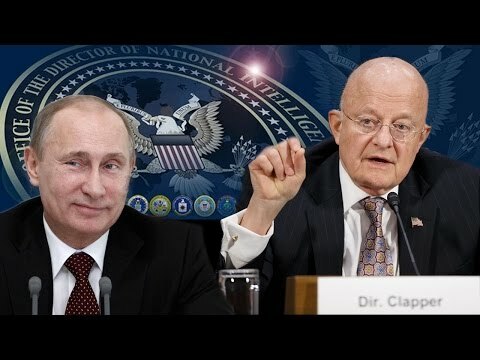 Brian Ross then added that former Director of National Intelligence James Clapper said he had seen no evidence of collusion when he left the government in January. With the Republicans controlling every committee in Congress, as well as the executive branch, they should be able to shape the scope of the investigations. We hope they are just and honest, as well as tough and fearless. Just as I thought, it is very, very probable that millions of illegal aliens did indeed register to vote this last election and illegally cast their votes… most likely for Hillary Clinton. This was something that was driven by Obama and Clinton and they knew full well it was going on. President Trump has now mandated a task force to look into voter fraud and has put Vice President Mike Pence in charge of it. This is long overdue and a very good thing. And frankly, I don’t care which side of the political line the voter fraud falls on, it needs to be stopped. Especially from those voting illegally in this country. Evidence of voter registration among illegals has existed for years, and things may be getting worse. The staggering number of illegal immigrants who may have voted in this past year’s election is too big to dismiss. 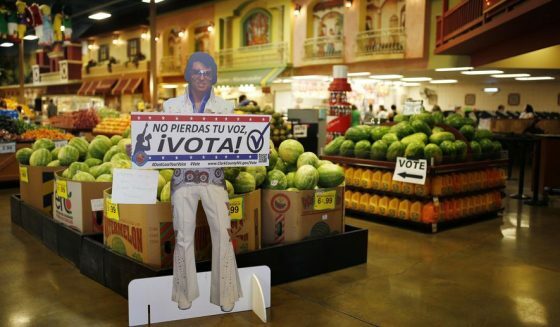 The National Hispanic Survey, a study in 2013 conducted by McLaughlin and Associates showed that 13 percent of illegal immigrants claimed they were registered to vote, according to The Washington Times. According to The Times, the independent data analysis group Just Facts reportedly examined the results from the National Hispanic Survey and applied them to U.S. Census data, concluding that as many as 2.1 million aliens could have been illegally registered this past fall. “Contrary to the claims of many media outlets and so-called fact-checkers, this nationally representative scientific poll confirms that a sizable number of non-citizens in the U.S. are registered to vote,” Agresti said. Non-citizens voting in elections in the United States is completely illegal. Add that to the recent development of possible voter fraud by citizens being bused into New Hampshire from other states to vote in the swing state, and we have two very probable instances of voter fraud. In his interview with Fox News’ Bill O’Reilly that aired on Super Bowl Sunday, President Donald Trump said a task force studying illegal voting in the United States will focus on just the kind of illegal voter registration the National Hispanic Survey found. Vice President Mike Pence will lead the group. Had the shoe been on the other foot and the left suspected massive voter fraud like this, they would have screamed bloody murder and demanded an investigation and probably legal action. But since it was the left doing it, they try and paint anyone even hinting at voter fraud as a crazed conspiracy nut. But that doesn’t make it any less true. Voter fraud has always been a huge problem and it is long past time we confronted it and cleaned up the system. The popular vote isn’t popular when it’s illegal. The voter rolls should be cleaned up state by state and voter registration verified. Voter ID should be required and there should be unbiased voting monitors, redundant backups to verify results and video of everything taking place at voting locations. Pence has a big job in front of him. This is why I said long ago that illegal aliens could keep Marxists in control in America indefinitely if allowed in and were permitted to vote. It almost worked, but not quite. The sad truth about Martin Luther King, Jr. is that his original mission of equal rights for black Americans changed later in life when he was surrounded by pro-Moscow communist advisers who turned him against the Vietnam War. A noble effort to save South Vietnam from communism was eventually defeated, not by the communist enemy on the military battlefield but by a Democratic Party-controlled Congress which terminated assistance to the government in Saigon. Vietnam became, and remains, a communist dictatorship. Lewis became one of many black pawns in this Soviet scheme when he wrote for Freedomways—a propaganda organ of the Communist Party USA, and Soviet front organizations such as the World Peace Council—for 25 years. Freedomways was influential in the black community. Lewis wrote a 1965 Freedomways article, “Paul Robeson: Inspirer of Youth,” about the famous actor and singer who had been a member of the CPUSA and admirer of Soviet dictator Joseph Stalin. In one of his more controversial statements, Robeson said that “American Negroes would never go to war against Russia,” because blacks loved Russia so much. The communist penetration and manipulation of the civil rights movement has been documented in the Operation SOLO documents still on the FBI website. They demonstrate that the Soviet Union illegally provided funding, reportedly more than $28 million, to the Communist Party USA, which then provided some of it to Freedomways. The documents are based on FBI informants, Morris and Jack Childs, who had infiltrated the highest levels of the CPUSA and had participated in meetings with foreign communist parties. 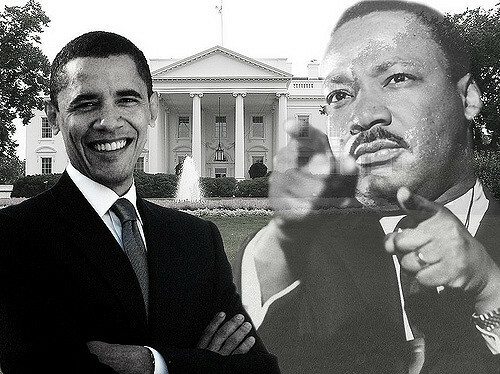 The presidency of Barack Obama proves that Martin Luther King, Jr. was not the last black figure to be manipulated by Moscow. In Obama’s case, it was Frank Marshall Davis, his mentor and suspected Soviet espionage agent. Strangely, Davis was recommended as a father figure for Obama by Obama’s own grandfather, Stanley Armour Dunham, who was reputed to be a CIA officer monitoring Davis’s communist activities. It’s funny how the CIA did not issue any public warnings or alerts about the Russian influence on Obama before he took office in 2008. Nothing surfaced in the press from the CIA about Obama’s communist connections in Hawaii or Chicago. It’s also strange that Dunham’s FBI file was conveniently destroyed in 1997. Horne’s reference to African-Americans as “a people who have been the least anticommunist and the most left-leaning of any constituency in this nation” reflects Moscow’s successful effort to manipulate the civil rights movement and divert some of its members into pro-Moscow causes, such as abandoning the people of South Vietnam to communism. For his part, Obama has abandoned the people of Crimea and eastern Ukraine to the Russians. It’s Obama, not Trump, who ordered the CIA to support Syrian “rebels” and jihadists, only to provoke a Russian military intervention that has left Russia and its allies with major gains in the Middle East. By any objective measure, the Russians have benefited nicely from the Obama presidency. Yet it’s Trump who stands accused by the Democrats and their media allies (and some conservatives) of being pro-Russian. Having been left with a weakened U.S. military and foreign policy disasters around the globe, it’s no wonder that Trump wants to see if the Russians can be persuaded to stop their aggression. It may be a false hope, but he seems to think it is worth talking about. In any case, a U.S. military confrontation with Russia in Europe or the Middle East doesn’t make any sense at this time. We’ve asked the question before, and it’s worthwhile to ask it again, as Obama leaves the presidency. Why was Gerald Horne’s speech about the history and “future” of the CPUSA? Was he saying something about Obama that only he and other CPUSA insiders knew? Did Horne know something special about Obama’s relationship with Davis? Indeed, had information about Obama been provided by Davis to other CPUSA members? And what did the CIA know about Obama’s communist connections to Davis and others? Horne anticipated that Obama would go down in history because he understood that the CPUSA had been working in the black community for decades, laying the groundwork for Obama’s candidacy. If Lewis really wants to expose Russian influence, let’s begin with an inquiry into how the CPUSA targeted black intellectuals, entertainers and politicians, by using a CPUSA-controlled and Soviet-funded journal called Freedomways. We can also take a look at Barack Obama’s connection to a Russian agent by the name of Frank Marshall Davis. Obama has been an utter failure where the military is concerned and that has been by deliberate design. He has gutted our forces to WWI levels. He has decommissioned our ships, artillery and planes. He has stripped the troops of needed supplies, food and weaponry. Then he has imposed a perverse social engineering on them to destroy their morale. In other words, he has tried to destroy the greatest military force on the planet and he almost succeeded. What he didn’t count on was Donald Trump and his strong military Cabinet. 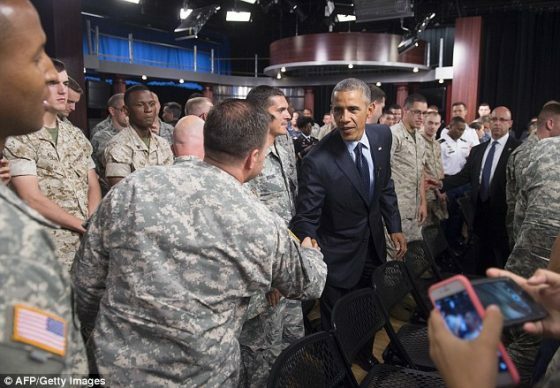 Is it any wonder that Obama leaves office and is roundly hated among members of the military? 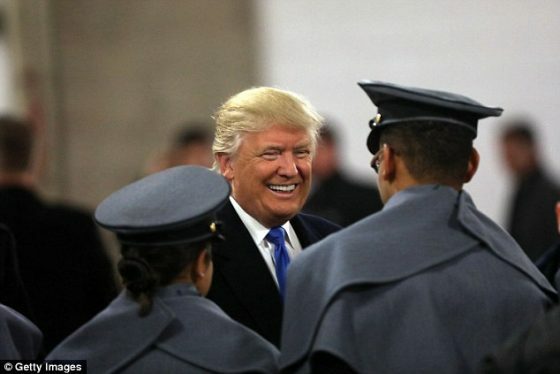 They can’t wait for President-elect Donald Trump to take command. He’s already said that he is planning on massively expanding the Navy. He’s negotiating new aircraft and he has vowed that our Army will be the strongest in the world once more. I have seen high ranking military men literally weep when shaking Trump’s hand. That tells you everything you need to know right there. President Obama is leaving the White House with majority disapproval among members of the military for his role as commander in chief, according to a new survey at the tail end of his presidency. 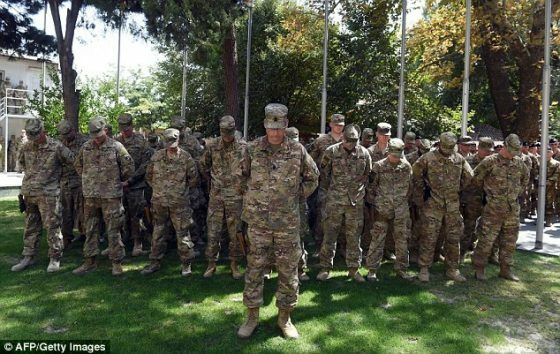 Obama’s move steep reduction of U.S. forces stationed in Afghanistan after a troop surge, and his withdrawal of forces from Iraq in keeping with a status of forces agreement, doesn’t appear to have carried support in the the military. Forty three per cent said the U.S. should deploy more troops to combat zones, while 32 per cent favored reductions, according to the poll by Military Times and the Institute for Veterans and Military Families at Syracuse University. President-elect Donald Trump’s campaigned on a call to make ‘America first’ and avoid overseas engagements. 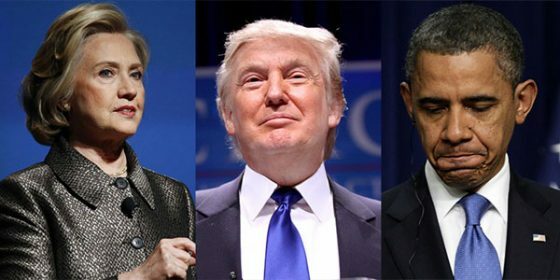 The poll said 49 per cent backed President-elect Donald Trump in the campaign, compared to just 29 per cent for Hillary Clinton. Each touted their support among military brass during the campaign. 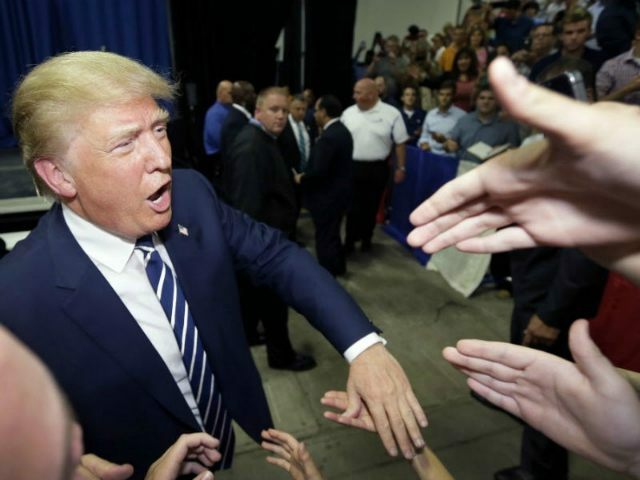 Election exit polls had Clinton beating Trump among military members by 50 to 44 per cent, while Trump beat her among veterans 60 to 34 per cent, CNN reported. Obama got a 52 percent unfavorable rating in the survey, AOL reported. He had an 18 per cent favorable rating with 18.4 per cent rating him somewhat favorably. More than half the troops despise Obama. 49% voted for Trump in the survey and I’ll just bet it was more than that. When Obama gave his military farewell speech, he gave it to an empty stadium. No one respects the man… they detest him and his weakness and hatred of the military. Every action that Obama has taken from Afghanistan, to Iraq, to Libya, to Yemen, to Syria has been an unmitigated disaster for the US. The only ones it has helped are the Islamic butchers we are supposed to be fighting. I contend that was on purpose. Yesterday, Obama just approved enough uranium to the Iranians for ten nukes and he has gifted them billions of our dollars… exactly whose side is he on? I think that is obvious. The exit polls on election day were a massive lie. They showed the military breaking for Clinton. It’s abundantly clear that was not the case. Obama has made us extremely less safe and capable as a nation and militarily… Clinton would have finished us off. Obama has actually assisted ISIS in their growth and atrocities. He’s also aided al Qaeda. He says one thing, but it is what he has actually done that makes his actions so treasonous. Obama’s farewell to the military was to an empty stadium, whereas George W. Bush’s was to a packed one. Our warriors know a true leader when they serve under one. 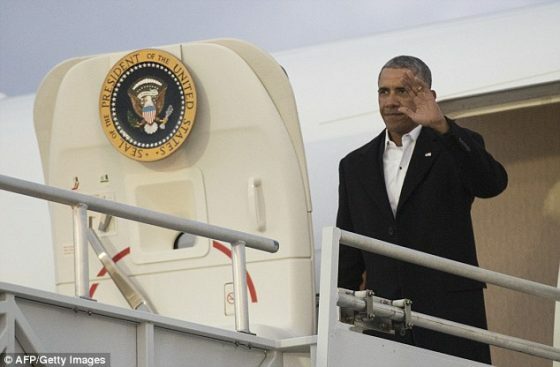 The only real salute Obama gets on his way out the White House door is a one-fingered one. It’s all he deserves. It was literally a red letter day when commie Van Jones got kicked out of the Obama administration. Glenn Beck had a lot to do with that, but the real force behind Van Jones getting the boot was my colleague and friend Trevor Loudon, who has done extensive research into Van Jones’ communist and radical ties. CNN of course took him in and I bet he feels right at home on their network. He sat down with Jake Tapper to mull over the future leadership of the Democrat Party and I sincerely recommend you take his words to heart. Van Jones bluntly stated that the Clinton days are over. Now, the Democrat Party will be led by radical leftists such as Bernie Sanders, Elizabeth Warren, Kamala Harris and Keith Ellison. No longer will they be moderate. Instead, they will be true to their radicalized roots. They will embrace groups such as Black Lives Matter, the New Black Panthers and the Nation of Islam. They will align with the Communist Party USA and Democratic Socialists of America. The Democrats are now the communists and they are out of the unionist closet. 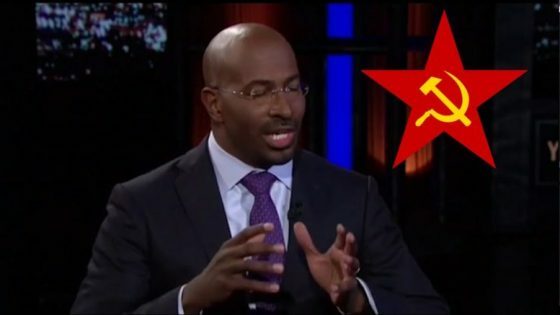 Radical CNN political commentator Van Jones, an avowed communist and 9/11 truther whose views are so extreme that he was booted out of the Obama regime once he was exposed, appeared on State of the Union with Jake Tapper to address future leadership in the Democrat Party, which has been fundamentally transformed into a party largely comprised of coastal, elitist, leftist snobs. Van Jones, a founder of the Maoist organization STORM (Standing Together to Organize a Revolutionary Movement), a communist front group, told Tapper that both the “Clinton days” and the “idea that we’re going to be this moderate party” are over and that the Democrat Party will be led by radical progressive leftists like Bernie Sanders , who is actually an Independent and a Socialist therefore not part of the Democrat Party, and Elizabeth Warren ﻿going forward. Jones also predicted that recently elected Democrat Kamala Harris, who will replace longtime California Senator Barbara Boxer ﻿in the U.S. Senate as a future leader in the party as well as anti-Semitic Muslim Congressman Keith Ellison, aka: “Keith X,” a follower of America-hating racist and Jew-hater Louis Farrakhan. Van Jones thinks that Kamala Harris will be a leftist superstar: “She’s going to be out there defending those dream — those Dreamer kids, because they’re a big part of her constituency. But she’s — and she’s got African-American roots. She’s got Asian roots. She’s female. She’s tough. She’s smart. She’s going to become a big deal.” Not as big a deal as President-elect Donald Trump who is going to have some say over the Dreamers. Identity politics is a losing proposition, I guess Van Jones didn’t get the memo and the Dems are doubling down on failure. Van Jones smacked Hillary Clinton for not picking a commie as her VP: “I think that a Keith Ellison is very important because he is somebody who represents the progressive wing of the party. One thing that happened, when Hillary Clinton had a chance to make a VP pick, she didn’t pick someone from the progressive wing, which made it much harder to heal those wounds with the Sanders’ and Elizabeth Warren wing. Keith Ellison represents that wing very, very well.” No… he represents Islam very, very well… but he’ll do in a Marxist pinch. Ending off, Van Jones used his atypical arrogant and condescending persona to tell the world that being a “moderate” in the Democrat Party is the equivalent of being not “authentic” and that if you’re a moderate Democrat, you’re basically a racist. He also made it damn clear that you need to be a radical communist to find a home in the Democrat Party. He doesn’t get that this type of crap is exactly what got Donald Trump elected and gave both the House and Senate to the Republicans. Keep it up… with the left deciding to go even further to the left, they are ensuring that Republicans will stay in power for a very long time to come. There is an easy way to determine who is a faithful Democratic Party hack in the media and who on the left maintains at least some independence from the party line. Long-time Democrat Bill Moyers thinks it’s an open-and-shut case that Russia’s Vladimir Putin intervened in the election to help Trump and that our democracy is in peril. The Intercept thinks the evidence is weak, and that the CIA may have some other reason for “squaring off directly against Trump.” What could that possibly be? Could it be that CIA Director John Brennan fears that Trump as president could order an investigation into what the CIA has been up to under President Obama? What could that be? Could the CIA have been interfering in foreign elections, and if so, could such efforts have provoked Russian retaliation? The folks at the Intercept are on the far-left, but have decided to maintain some semblance of objectivity when it comes to sensational claims of foreign interference in the 2016 campaign. However, the idea they propose—that the controversy can be solved by President Obama declassifying evidence—is not practical. Obama won’t do it, because the intelligence agencies always claim that disclosure will reveal sources and methods. If they do release “evidence,” it will be vague and mostly worthless, just like the stories in The Washington Post and New York Times, where these allegations initially surfaced. These stories are impossible to confirm or deny. The CIA will want to hide its hand, not because the evidence may implicate Russia in election interference, but because the evidence we do have demonstrates that the CIA is currently interfering in the results of the 2016 U.S. presidential election. That’s the story that cannot be told, and the one which threatens our democracy. The Times and Post are vehicles for this insidious effort. 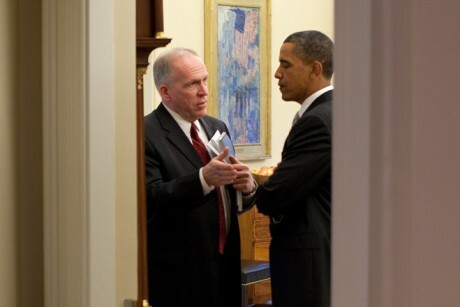 We do know that CIA Director Brennan is a far-left extremist—just like Obama himself—who once voted for a Communist Party candidate, and whose sympathies for radical Islam are well-known. Questions persist about whether Brennan, an alumnus of Catholic Fordham University, converted to Islam and why he took his oath of office on a copy of the U.S. Constitution and not the Bible. But rest assured. Snopes, one of those liberal entities that is now part of the Facebook operation to detect “fake news,” says Brennan’s conversion to Islam remains an “unsubstantiated rumor.” Snopes does, however, report that it is true that Brennan “was sworn in to his office not on a Bible but on a copy of the Constitution.” A photo exists of the occurrence. The real “fake news” surrounds the claims that Putin intervened to help Trump. At a post-election crying session, Hillary Clinton said that Putin hated her because he associated her with protests against his rule in Russia, and he wanted to get even. Putin did accuse her of stoking the protests. But where is the evidence that the alleged hacking was payback? What’s more, is there evidence that the protests in Russia were inspired or funded by the U.S.? Perhaps that issue ought to be resolved. Since we know that the Obama administration interfered in foreign elections in Canada and Israel, is it that incredible to believe that the Clinton State Department had a hand in the anti-Putin protests? We noted in a column that Obama had tried, but failed, to take out Israeli Prime Minister Benjamin Netanyahu, but did succeed in taking down Canada’s Conservative Party Prime Minister Stephen Harper, a big supporter of Israel. Where was the media outcry over that? An additional question is whether or not Obama used the CIA to interfere in foreign elections such as those in Russia, Canada or Israel. It may be the case that the Democrats and their media allies have opened up an entire Pandora’s Box when it comes to interference in elections. Shouldn’t we “drain the swamp” here before we focus on what others have done to us? The issue of U.S. interference in foreign elections is a matter that should be investigated by Congress if it goes forward with a probe into alleged Russian hacking into the 2016 U.S. presidential election. If the inquiry regarding Russia determines that Putin wanted to destroy Hillary’s campaign and elect Trump, that doesn’t make Trump a dupe of the Russians. It may have just been a personal Putin vendetta against Hillary. The real issue is what policies these two candidates would have pursued. We already know that Obama and Hillary staged a Russian reset that was a spectacular failure, and that Putin used this new development in relations between the U.S. and Russia to launch military aggression in Ukraine and Syria. So the former KGB chief running Russia knew he could get the better of Hillary if she became president. Writing at Forbes, Paul Roderick Gregory looks at the evidence of how Trump poses a far greater threat to Putin, not in threatening military action against the Russian regime, but in seeking American energy independence. He says, “If Putin’s core objective is indeed to protect his petrostate, he would not root for Trump. The US fracking revolution has transformed the world energy market from $100 to $50 oil, has broken Russia’s dominance of the European natural gas market, and has plunged the economy into a prolonged ‘period of stagnation,’ as the Soviets used to call it. Under Trump, Putin can expect a second energy revolution, which will threaten Putin’s hold on power, which looks strong but is weaker than we think.” This is why there have been reports that the Russians are secretly subsidizing anti-fracking groups in the West. Gregory says that if you look at the energy picture from Putin’s perspective, he would have preferred the Obama/Clinton policies that “blocked pipelines, imposed strict regulations on unconventional oil and gas, froze leases on federal lands, and used other anti-carbon actions” that had the ultimate effect of propping up the value of the oil resources of his shaky regime. If the Democrats really wanted to take down Putin’s regime, they would abandon their anti-fossil fuel policies, give up on a “climate change” agreement that benefits our adversaries, and support the President-elect’s policies of growth and resource exploration and exploitation. Instead, they want to blather on about Putin’s hatred for Hillary, using anonymous CIA sources in the media to make a case for a narrow probe. Let the investigations begin. Let them be far-reaching and broad. Let’s determine what Obama and Hillary’s State Department did not only to Russia, but to Israel and Canada as well. And let’s find out if the CIA was part of this destabilization effort. If pursued by a Republican Congress with the guts to probe what really went on and get to the bottom of what the CIA has been up to, we may be looking at a scandal that could shake the foundations of the political party that has occupied the Oval Office for the past eight years. This might be the only way to teach the CIA a lesson about not interfering with the results of an American election. We know this truth to be self evident: Illegals Voted. Liberals are having a psychotic episode over the election of Donald Trump. Their threats before the election to leave America and give up their citizenship if he won were very entertaining to hear. Now that Trump did win they are coming out of the woodwork like an army of termites crying, screaming, rioting in the streets and foaming at the mouth that Trump-Is-Not-My-President. It’s as if they were part of a choreographed flash mob or a church choir all singing the same song. Since most of this is being financed by the same left wing people its safe to say they are being choreographed. The headlines on cable news and print media carry the same or similar messages as Breitbart reported today: CNN’s Rye: Trump’s election “Far from legitimate,’ ‘That guy is not my president’ to Michael Moore: Trump ‘Has no right to enter’ White House. Its bad enough to be brainwashed by the mainstream media and virtually every talk show on TV with this same unending monologue, but some leftists have gone a step further and have been taunting and threatening the Republican delegates to the Electoral College to “vote their consciences’ when the delegates assemble in each state capitol tomorrow to vote. Even a handful of has been Hollywood leftists with deep pockets have joined in to produce videos aimed directly at each delegate to offer more persuasion to switch their vote. All of this because Hillary Rodham Clinton won the overall popular vote while Donald J. Trump won the states with the most Electoral Votes. The liberals claim that Hillary’s 3-million popular vote plurality over Trump makes her more deserving to be president. But what about those 3-million votes? Where did they come from? New York and California gave Hillary a very big win that accounts for most or all of her popular vote plurality but these states have always been traditional Democrat controlled strongholds. They are also two of a handful of states that don’t require voter identification to register or to vote. It has been estimated that there is anywhere from 10-20 million illegal immigrants living in the United States with over a million living in California alone. And, as with those people on welfare, they usually vote for Democrats in very large numbers. To make matters worse, if that is even possible, courts have frequently ruled against voter ID requirements, and even showing proof of citizenship. And last but not least, Barack Hussein Obama publicly advised a young immigrant woman who asked if she should fear voting, because immigration will come and get her and her family. The exact transcript of the exchange was reported on BizPacReview. 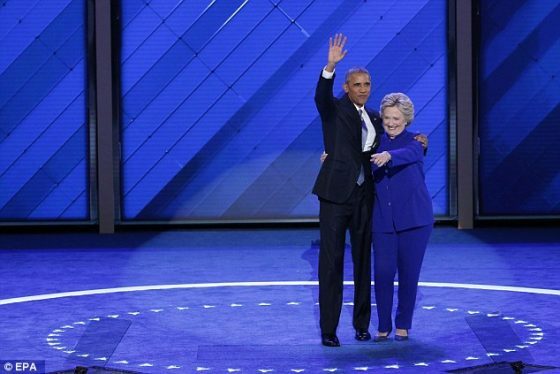 With the highest ranking Democrat in the nation telling people it is OK to break the law and vote even if you are not a citizen and not to worry about anyone trying to deport you, it is obvious that a very large number of votes received by Hillary Rodham Clinton did not come from citizens of the United States. So just how many valid votes did she get? If the recount effort in Michigan is any clue, 37% of the precincts in Detroit found that they could not re-certify the count totals because they found too many discrepancies, doesn’t that tell you something? In 248 of Detroit’s 662 precincts, more votes were recorded on voter machines than should have been in the November presidential election, The Detroit News reports. The state will audit the 20 precincts that showed significant problems. The audit was triggered by shocking results at one polling place where 306 people were recorded to have voted, but only 52 ballots were found sealed in the container. None of this is really surprising since the national Democratic Party is just as lawless and has always been as corrupt and dishonest as Hillary Rodham Clinton and the entire Clinton Family Foundation //aka// the Clinton Crime Syndicate. Old time Democrats will always remember the traditional instructions to: “Vote early and vote often.” And keep track of the local obituaries so you can always vote in the name of a recently departed. Strip away all these illegal votes and Donald J. Trump was elected by a landslide. It has been hard for some to digest President Trump’s overwhelming victory from the American people. They do not care about Clinton’s scandals and how many times she’s changed things. Jill Stein, and others like her, insist on wasting time, resources and taxpayer’s money to do a recount. Trump’s win is hard for them to accept. Why did President Obama wait and order an investigation before he leaves? Why didn’t he check before the election? Why did he not check with his intelligence agencies? They are trying to politicize lots of things from the left and they are sending taxpayer’s money down the drain forever. There should be justice. I hope God will intervene, send angels and make things happen. They are always playing dirty politics in some way or another. For example, at first Clinton said she would accept the election, whereas Trump was doubtful. She made a big issue out of it! Now she is asking people to do a recount in Wisconsin, but that resulted in Trump getting 162 more votes. She insists there is voter fraud. She’s just like Jill Stein. Any neutral person can easily see these things derive from the other incidents. The DNC collaboration with CNN – remember Donna Brazile? What do we say about that? What do we say about writing about Bernie Sanders and not letting him win? What do we say about Clinton’s foundation getting donations and being financed by those who do not support women at all? They say these are reliable sources, but what do we call the above? What about Bengazhi? How many times does Clinton change her stand? What does President Obama say about that? Why didn’t President Obama look into the election before he started, if he thinks there is an issue? Did you see Project Veritas? Did you see what Clinton and other Democrats did? They blamed Trump for instigating violence, whereas they were doing the same thing … quietly. Where does all this fake news originate from and how do they manipulate and play so many games behind the scenes? They haven’t liked Donald Trump at all from the beginning. He is a straight shooter, very direct and gets things resolved as a businessman should. He isn’t a lobbyist either. You can tell he wants the best of the best serving with him. You can tell by the way he selects his cabinet. This is proof. I believe truth will always win in the end.